With the advent of the microwave, it seems old-fashioned stovetop popcorn popping has become a lost art. Potential health risks and the environmental waste of microwave popcorn aside, old-fashioned popcorn just plain tastes superior. It's easy and lots of fun to make too. Best of all, popping your own corn means you can experiment with all of the fantastic heirloom popcorn varieties now available. Eat it plain, drizzle with olive oil or butter, or dress it up with spices — the possibilities are endless! 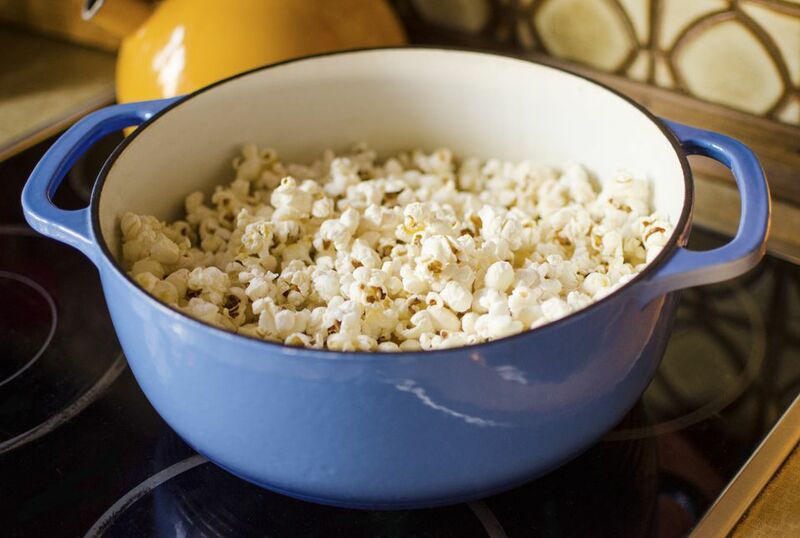 Add the oil and popcorn kernels to a heavy 3- to 4-quart saucepan with a lid. Shake the pan to coat the kernels with oil. The kernels should cover the bottom of the pan in a single layer. Cover the pan and place it over medium-high heat, shaking the pan occasionally until you begin to hear popping. When the corn begins to pop, lift it slightly from the heat and shake the pan continually, holding the lid in place, until the popping begins to slow, about 3 to 4 minutes. Remove the pan from the heat. Leave the lid on for 1 minute — some kernels will continue to pop. When the popping stops, pour the popcorn into a large bowl. Enjoy plain, or season as desired with olive oil, butter, salt, or spices.